Starting in 1948 the U.S. military made a valiant but futile effort to replace its World War I-vintage Colt M1911A1 pistol. The U.S. Army approached several companies to submit bids. Ithaca declined to bid. High Standard, Colt and Harrington & Richardson all submitted proposals, but the Army quickly rejected the latter. The Army contracted with High Standard and Colt to develop alternatives — the T3 and T4, respectively. The Army demanded that the pistols should not exceed seven inches in length and be no heavier than 25 ounces unloaded. The military requested that the pistols use a blow-back action and have a folding trigger-guard so the shooter could wear thick gloves. The government dropped the requirement for the new pistols to incorporate a “squeeze charger” system. High Standard built several T3 prototypes and trial models, each with minor improvements compared to the previous edition. The position of the safety and magazine releases changed with each iteration. The prototype and first batch of pistols had magazine releases on the heel, while the second batch placed the magazine release on the frame. 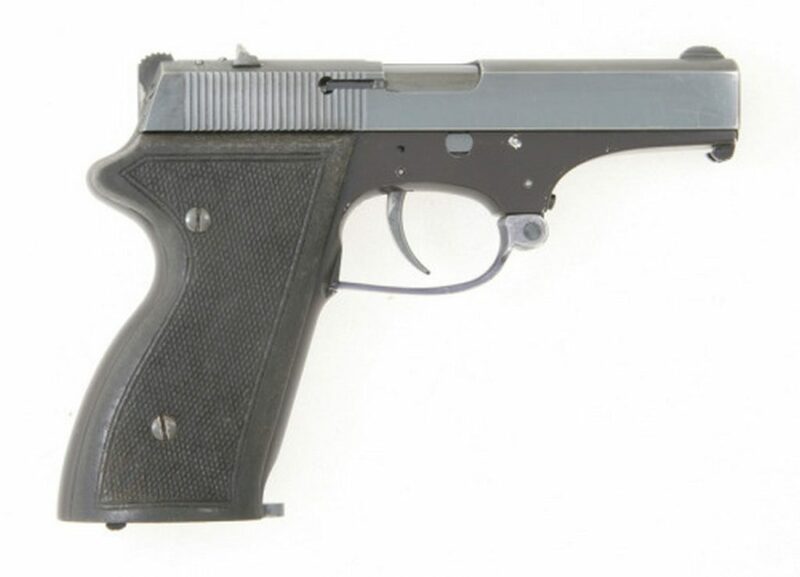 The first prototype High Standard pistol didn’t yet have the pivoting trigger guard that would become standard in the later experimental models. The second batch of pistols boasted a thicker trigger guard than the first set did, plus a repositioned and enlarged safety. 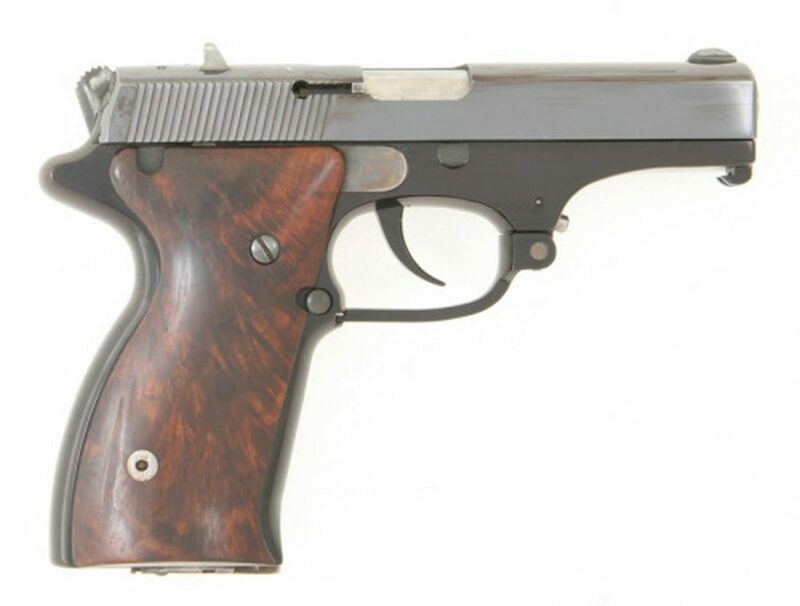 In June 1948, High Standard submitted to the government the first batch of three T3 test pistols. The T3 had a frame made of 75ST aluminum and steel. It used a straight blow-back action, but had annular grooves in its chamber that caused the cartridge case to expand, in theory slowing the rearward travel of the slide and the opening of the breach. High Standard believed the grooves — the invention of Mauser Werke’s Otto-Helmuth von Lossnitzer — would mitigate some of the gun’s sharp recoil. To meet the military’s specification for a glove-compatible trigger, High Standard’s George Wilson designed a pivoting trigger guard that neatly folded into a recess in the frame. The guard also incorporated a spring-loaded plunger. This plunger pushed into place against the trigger when the user pivoted the guard into the open position and latched to the pistol’s frame. The plunger impinged against the trigger making the trigger pull heavier. In theory, this would compensate for an operator wearing gloves. The first batch of T3s used a double-action trigger and featured a single-stack magazine holding seven rounds — same as on the M1911A1. The Army tested the first batch of pistols took place at Aberdeen Proving Ground in May 1949. There were several failures. One pistol’s hammer broke due to inadequate heat treatment that left it brittle. A number of failures-to-feed also occurred as cartridges upended in the breech. High Standard rectified the failures with the addition of a guide shelf at the top of the chamber to help move the cartridge into the chamber. The Ordnance Corps revised the specifications, requiring a 13-round magazine while also allowing the weapons to weight up to 29 ounces. In April 1950, High Standard got $20,000 — approximately $200,000 today — for a second batch of three improved pistols. The second batch of T3s abandoned the annular chamber grooves and had a redesigned frame to take the larger magazines. Springfield Armory tested the new batch of pistols in March 1951. The 75ST aluminum frames suffered a series of failures at stress points, probably due to the bigger frame. The Ordnance Corps recommended that High Standard make the frames from heat-treated 14ST aluminum and reinforce the weak points in the frame. High Standard designed the second batch’s controls to be more like those on the M1911. In April 1951, the Army noted that the second batch of refurbished T3s were unsatisfactory, having suffered 19 failures in 150 rounds. The hammer of one pistol broke and the Ordnance Corps recorded further failures-to-feed. The Army returned the pistols to High Standard. High Standard refurbished the pistols and the Army held a second test at Springfield in September 1951. Testing officers recorded seven failures including further misfeeds and stress fractures in all three of the pistols. The Army ordered a third batch of pistols. High Standard reverted the design back to a single-stack magazine holding eight or nine rounds. Despite this, during testing in November 1952 the pistols suffered numerous failures and an excessive number of malfunctions. The magazine-release broke during an endurance test. The slide-stop malfunctioned. The second pistol’s hammer cracked and it also suffered extraction problems. The Army returned the pistols to High Standard to fix. A final trial took place in March 1953. However, the Army again found the pistols to be unsatisfactory — and the Ordnance Board officially canceled the T3 program. In 1955, the Army considered inviting foreign manufacturers into the M1911 replacement-effort. But the Army’s deputy chief of staff for logistics rejected the service’s request for $150,000 in funding on the grounds that sidearms were seldom used anymore — and existing stocks of M1911A1s were more than adequate.